The flat will probably be put up for sale so once we have been and removed all his personal items we just need it all emptied. Can you give me a cost please as I need to know whether it is best to clear it all or just get a couple of skips to put it all in, we would need this done mid to late March and we would be leaving the keys with an estate agent on the high street for collection. I hope this is ok and if you have any questions please give me a call. The house clearance was completed on behalf of the customer and the following items pictured below were cleared from houses in the Ashington area and donated to various charities. Our house clearance staff transported the non reusable items from the house clearance to a waste recycling centre. 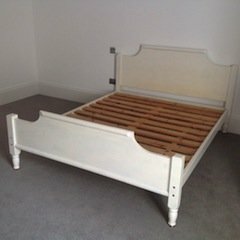 A hand painted cream, solid pine double bed frame. 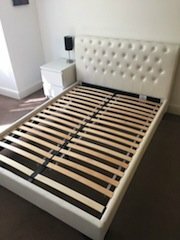 A double bed frame on castors, together with a removable double headboard, upholstered in white faux leather. 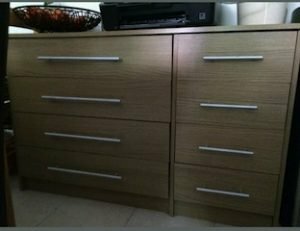 A large solid wood chest of drawers, having four large drawers aside four small drawers. 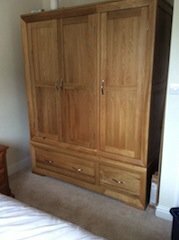 A tall standing solid oak triple wardrobe, having a double and single wardrobe, above a large and small drawer. 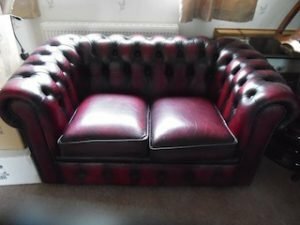 A small Chesterfield two seater sofa, upholstered in ox blood red authentic leather. A set of four vintage mahogany ladder back dining chairs, upholstered to the seats in colourful patterned fabric. 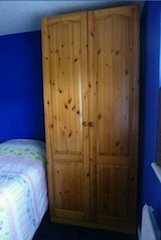 A tall standing solid pine double wardrobe, having two doors opening to reveal a clothes rail and two shelves. 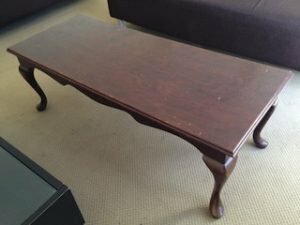 A large rectangular solid mahogany coffee table, on four splayed legs. 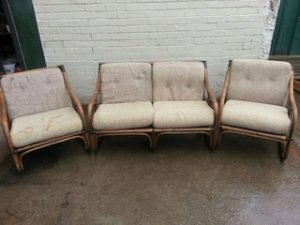 A three piece conservatory suite, to include a two seater cane sofa and two matching armchairs. 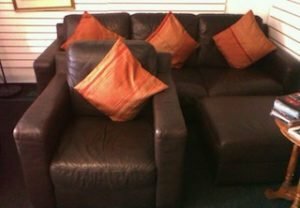 A three piece sofa suite, to include a three seater sofa, an armchair and a storage footstool, upholstered in chocolate brown faux leather. A victorian solid oak, heavily carved dining chair, upholstered to the backrest and seat in authentic leather. 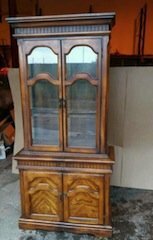 A tall standing vintage, solid pine display cabinet, having two glass inlaid doors opening to reveal three shelves, above a double cupboard. 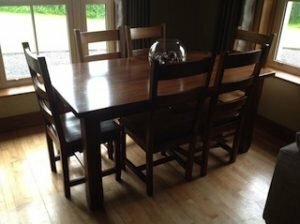 A solid oak rectangular dining table, together with six matching ladder back dining chairs. 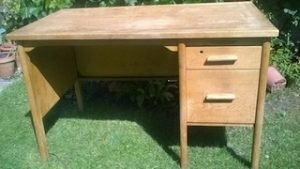 A solid pine computer desk, having one small drawer above a large drawer to the left side. 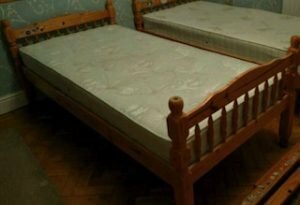 A pair of solid pine single bed frames, each with a single mattress. 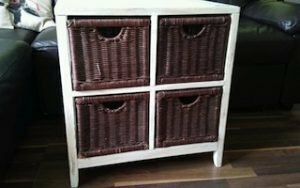 A white square solid wood unit, having four large wicker baskets as drawers.